We are just about one week away from the big game. After 256 NFL regular season games and three weeks of thrilling playoff action, we are just about one week away from the big game. We have seen young superstars emerge, some teams ascending from the ashes while others fell off badly, historic offensive numbers being put up and two electrifying Conference Championship games ending in a controversial manner. 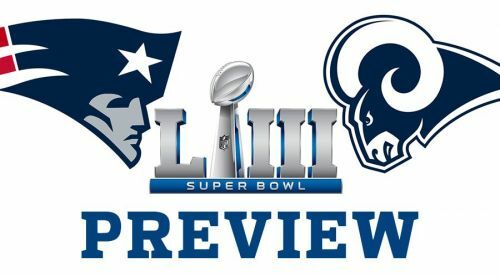 However, after all the drama we have seen over these last five months, we end up with the Super Bowl favourites from the preseason squaring off on February the 3rd. On one side we have the Patriots, who have dominated the league, making it to the final game in half of the last 18 seasons, and on the other is a team in the Rams that went 4-12 just two years ago and hasn’t made it there since 2001. That was when these two squads faced off against each other, featuring the ‘Greatest Show on Turf’ under MVP Kurt Warner as two-touchdown favourites against the defensive-minded Pats with some first-year starter at quarterback named Tom Brady. With New England winning the game on a last-second field goal, this launched one of the (if not the) greatest dynasties in American Sports history, led by what is widely considered the best quarterback-head coach combination ever, while the Rams would go on to win just two playoff games until this season. Here we are 17 years later – the most dominant team in the NFL over that stretch facing off against a young bunch in the LA Rams, that many look at as the most talented squad. Jared Goff as the youngest quarterback ever to start a Super Bowl versus the oldest one in Brady. The youngest head coach ever to start a Super Bowl in wonderkid Sean McVay against the old master in Bill Belichick. The Rams versus the Patriots Part II.